...It’s where potential clients come to find out who you are, what you do and what you’re about, and where new and returning customers can check your schedule and book classes. But your website is also so much more than that. It’s an opportunity to take your customer on a journey— one where they ultimately become the type of loyal client who recommends your studio to all their friends. I know it sounds a bit marketing ‘woo woo’, but think about it! If you go to into a shop and it’s absolute chaos and you can’t locate anything you need or flag down the help of a shop assistant, are you likely to keep coming back or recommend it to a friend? Not likely! Your website works in a similar way. You can’t just lead your customers to your website, and then leave them to fend for themselves. You need to figure out what journey you want them to go on in order achieve the most desirable outcome, then use your action navigation (more on that later) to guide them them on that path. But how do you do that, exactly? By taking these three steps! For the average fitness, yoga or pilates studio, there are two different types of customers. First, there’s your existing customers. who need a quick way to access their account, check how many passes they have left and sign up for their next class. Then, you have your new potential clients, who need answers to questions and welcoming first step towards attending their first class (which is partly where your brand message comes in!) You want to make it as easy as possible for both groups to get exactly what they need — and fast. The most obvious place to start when it comes to creating a seamless customer journey that ‘flows’ is your main navigation — the menu bar that normally sits at the top of the page. The menu items in this section need to be relevant for both your customer groups. Plus, you don’t want to overcrowd it and give your customers decision fatigue! Enter, the action navigation—a separate, clear mini-navigation, that often sits on top of your ‘informational’ pages to give a direct line to the most profitable actions someone can take. For example, existing customers don't want to click through three times each day, they want to check your class schedule — so you want to provide a ‘call to action’ that allows them to do this as quickly as possible. Likewise, new visitors may click around on several pages before they decide to give your studio a try — but they always need to know where that ‘sign up’ button is for whenever they’re ready. This navigation bar shows a clear "action nav" up top with quick links designed for current clients and also a clear nav link for new students as well. Okay, so it’s all well and good to have those action links staring your customers in the face like laser beams. But where should they actually lead to? Well, it depends on what the desired action is. If they click a ‘first class free’, link, they should land on a page where they can claim that offer, not be directed to your general pricing page with a slew of options they have to sift through. If you're linking externally to your MINDBODY store, be sure to use 'deep links' that will land your client with the specific item loaded on the page. You can learn where to find those here. For current clients who just want to get their class booked as quickly as possible so they can get on with their lives, the best option is to embed widgets from your scheduling platform, right on your website. You can watch a tutorial on how to do this with MINDBODY here and with Acuity Scheduling here. Want to make sure your studio's website has everything you need to attract and convert your ideal customer? 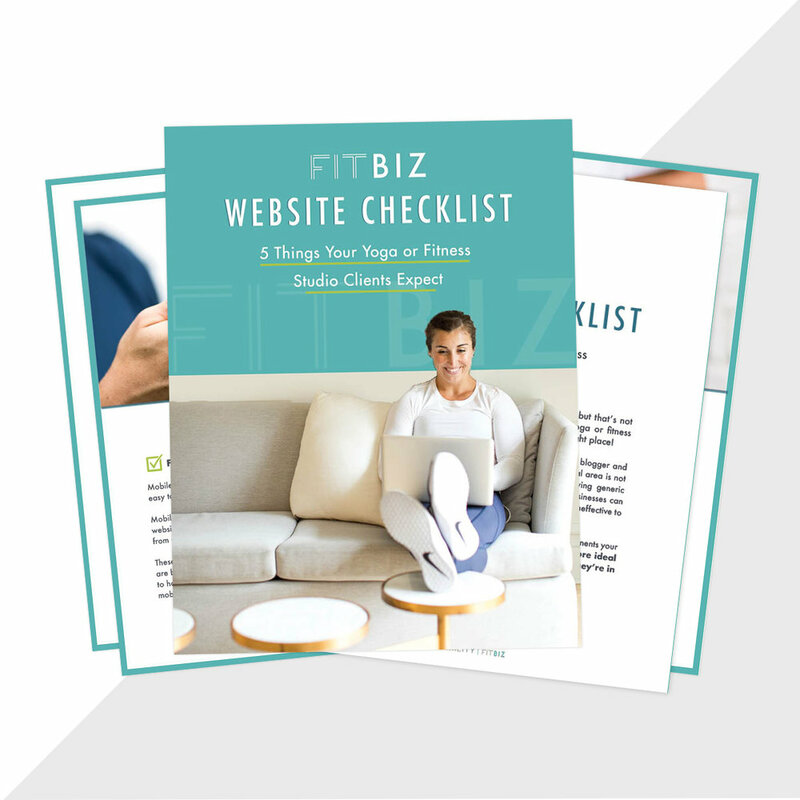 Click the button below and I'll send you my free FitBiz Website Checklist! Send me the checklist please!